For other people named Dale Murphy, see Dale Murphy (disambiguation). Dale Bryan Murphy (born March 12, 1956) is a former Major League Baseball outfielder, catcher, and first baseman. During an 18-year baseball career, 1976–93, he played for three different teams, but is best noted for his time with the Atlanta Braves. Murphy won consecutive National League Most Valuable Player Awards (1982–83), the National League's Silver Slugger Award four straight years (1982–85), and the National League's Gold Glove Award five straight years (1982–86). He is an inductee to the Oregon Sports Hall of Fame, Georgia Sports Hall of Fame, and World Sports Humanitarian Hall of Fame. In 1976 Murphy began his major league career with a nineteen-game stint catching with the Atlanta Braves. He appeared in only eighteen games the following season. In 1978 Murphy played first base mostly; at the plate he slumped to a .226 batting average, though he also showed hints of his future power by hitting 23 home runs. Murphy switched to the outfield in 1980, a move that would help initiate a decade of highly productive play in the National League. Beginning in left field, he soon switched to center field, the position at which he would find his greatest success. By 1982, the most decorated year of Murphy's career, the former catcher had transformed himself into an All-Star MVP outfielder who appeared in each of Atlanta's 162 games. His turnaround as a fielder was equally stark. In 1978 as a first baseman, Murphy had led all National League first-baggers in errors. In 1982, spending time at each of the three outfield positions, he won his first of five consecutive Gold Gloves, as well as the first MVP Award by a Brave since Hank Aaron in 1957 with what were then the Milwaukee Braves. Playing in the decade before the Braves began their dominance of the National League East, Murphy also made his only postseason appearance in 1982. He succeeded although the eventual World Series-champion St. Louis Cardinals eliminated the Braves in the 1982 National League Championship Series. The league's most valuable player failed to translate his regular season preeminence into October success, hitting safely but three times and scoring only one run. Murphy rebounded from the postseason sweep with another MVP award in 1983. The period ultimately proved the high-water era of Murphy's career. Each year during the four season span from 1982 to 1986 he won a Gold Glove, appeared in the All-Star Game, and placed in the top ten in MVP voting. In 1988, however, despite being voted to what would be his final All-Star appearance, Murphy's production began an inexorable slide downward. Never a particularly high average hitter, Murphy saw his batting average free-fall from .295 in 1987 to .226 in 1988. Only once more, in 1991, would Murphy bat above .250. Once a consistent source of power at the plate, he never again hit even 25 home runs in a season. The Braves traded Murphy after fifteen seasons to the Philadelphia Phillies in 1990. Murphy's three seasons with the Phillies were mostly uneventful. In his final season (1993), Murphy took a pay cut of over $2,000,000, down to the major league minimum, to join the Colorado Rockies for their inaugural season. During his last two years in the majors Murphy's batting average lingered well beneath baseball's Mendoza Line. Dale Murphy's number 3 was retired by the Atlanta Braves in 1994. Murphy finished his career with 398 home runs (19th in MLB history at the time of his retirement) and a .265 lifetime batting average. His MVP awards in 1982 and 1983 make him one of only four outfielders in major league history with consecutive MVP years; at the time, he was the youngest to have accomplished the feat. His many honors also include seven All-Star appearances, five Gold Gloves, and four Silver Sluggers. Murphy led the National League in home runs and RBI twice; he also led the major leagues in home runs and runs batted in over the 10-year span from 1981 to 1990. One of the most productive and decorated players of the 1980s, Murphy led the National League in games, at bats, runs, hits, extra base hits, RBIs, runs created, total bases, and plate appearances during the decade. He also accomplished a 30–30 (30 home runs with 30 stolen bases) season in 1983. Murphy played in 740 consecutive games, at the time the 11th longest such streak in baseball history. His jersey number ("3") was retired by the Atlanta Braves on June 13, 1994, in his honor as opposed to that of even Babe Ruth, who wore Boston Braves number 3 during the partial season with which his career concluded. Murphy was inducted into both the Oregon Sports Hall of Fame and the Georgia Sports Hall of Fame in 1997. Murphy's clean-living habits off the diamond were frequently noted in the media. A devout Latter-day Saint (Mormon), Murphy did not drink alcoholic beverages, would not allow women to be photographed embracing him, and paid his teammates' dinner checks as long as alcoholic beverages were not on the tab. He also refused to give television interviews unless he was fully dressed. Murphy had been introduced to that church early in his career by teammate Barry Bonnell. For several years the Atlanta Constitution ran a weekly column, wherein Murphy responded to young fans' questions and letters. In 1987 he shared Sports Illustrated magazine's "Sportsmen and Sportswomen of the Year" award with seven others, characterized as "Athletes Who Care", for his work with numerous charities, including the Make-a-Wish Foundation, the Georgia March of Dimes and the American Heart Association. Before a home game against San Francisco on June 12, 1983, Murphy visited in the stands with Elizabeth Smith, a six-year-old girl who had lost both hands and a leg when she stepped on a live power line. After Murphy gave her a cap and a T shirt, her nurse innocently asked if he could hit a home run for Elizabeth. "I didn't know what to say, so I just sort of mumbled 'Well, O.K.,' " says Murphy. That day he hit two homers and drove in all the Braves' runs in a 3–2 victory. He was ultimately granted several honors because of his integrity, character, and sportsmanship including, Lou Gehrig Memorial Award (1985), "Sportsman of the Year" (1987), Roberto Clemente Award (1988), Bart Giamatti Community Service Award (1991), and World Sports Humanitarian Hall of Fame (1991 Induction). Despite his reputation as a true 5-tool superstar, multiple MVP awards, and humble, squeaky-clean persona, Murphy did not get elected to the Hall of Fame. He first appeared on the writers' ballot for the Baseball Hall of Fame in 1999, the earliest possible year of consideration. He has failed to gain election, joining late New York Yankees outfielder Roger Maris and recently eligibile Juan González as the only three Hall of Fame-eligible recipients of multiple MVP awards not in the Hall. His failed candidacy has drawn particular notice due to his reputation as a clean-living player whose career was immediately followed by baseball's scandal-plagued "steroids era". Baseball writer Rob Neyer feels that the former MVP's candidacy has been hurt by a career that "got a late start and suffered an early end." Stuart Miller, baseball writer for the New York Times, also notes the "sharp decline" in production that plagued Murphy after the age of 31 in arguing, "Players who were great for a short time do not receive much [Hall of Fame] recognition." Finding "one of baseball's best players in the 1980s" to be "undervalued", Miller nonetheless writes that the Brave great "is typically considered a 'close but no' guy." Bill James, father of sabermetrics, says of Murphy, "It certainly wouldn't offend me to have him in the Hall of Fame. I just wouldn't advocate it." James' "current metric for Hall induction was 300 Win Shares (a complex mathematical equation weighing what players contribute to their team's [sic] victories)...." Murphy stands at 253 Win Shares. James ranks eight Hall of Famers below Murphy. However, others contend, "Murphy's incredible nine-year run in Atlanta was every bit as good as anyone else during his era," with many pointing out the fact that he was a rare bright spot of many miserable Braves teams in the 1980s. Neyer notes that the explosion of power during the steroids-fueled era that began after Murphy's retirement may have caused Murphy's numbers to pale in comparison for many voters. Some have argued that Murphy's reputation for clean living may encourage voters to "look more favorably on what Murphy did without using performance-enhancing drugs." (Murphy weighed in on the steroids issue in asserting that career home run leader Barry Bonds "without a doubt" used performance-enhancing drugs.) Sports Illustrated's Joe Posnanski has endorsed Murphy as an "emotional pick . . . a larger-than-life character who signed every autograph, spoke up for every charity and played brilliant baseball every day for mostly doomed teams." Nonetheless, though he continued to earn the requisite 5% to remain on the ballot, Murphy averaged only 13.6% over the first twelve years of voting. (Election to the hall requires 75%.) In the first decade of his eligibility, he "peaked at 23% in 2000 and fell to 11.5% in 2009." Moreover, as writers may only vote for ten players each year, some have argued that the candidacy of stars from the 1980s—such as Murphy, pitcher Jack Morris, and outfielder Tim Raines—will become imperiled as a wave of more recently retired players with more statistically impressive credentials becomes eligible in the 2010s. Noting his low vote totals, Murphy has said, "Since I'm not that close [to election] ... I don't think about it that much." On January 9, 2013, his 15th and final appearance on the Hall of Fame ballot, Murphy secured 18.9% of the vote, falling well short of the 75% necessary to enter the Baseball Hall of Fame on the BBWAA ballot. From 1997 to 2000, Murphy served as president of the Massachusetts Boston Mission of The Church of Jesus Christ of Latter-day Saints. In 2005 Murphy started a non-profit organization called the iWontCheat Foundation to promote ethical behavior, and deter steroid use and cheating in youth athletics. Since 2008 all players from the participating teams at the Little League World Series wear the "I WON'T CHEAT!" embroidered patch above the Little League Baseball logo on the left sleeve of their jerseys. In 2008, he was appointed to the National Advisory Board for the national children's charity Operation Kids. Murphy serves as a National Advisor to ASCEND: A Humanitarian Alliance. Murphy is a long time supporter of Operation Smile and also currently serves on the organization's Board of Governors. For the 2012 MLB season, Murphy was a part of the Atlanta Braves TV broadcasting crew and participated in the telecast of at least 14 games. He was the 1st-base coach for the USA team in the 2013 World Baseball Classic. He currently lives in Alpine, Utah. Murphy has written three books. The first, The Scouting Report on Professional Athletics, elaborates details of the professional athlete's lifestyle. Murphy discusses balancing career and family, working with agents, managing business affairs, serving one's community, and preparing for retirement. In his second book, an autobiography entitled Murph, he talked about his religious faith. He discussed the struggles of his early baseball career and how he overcame problems. In 2007 Murphy wrote his third book, The Scouting Report for Youth Athletics, in response to what he saw as the increase in negative behavior in youth sports resulting from poor examples set by professional athletes. Included with each book is a 50-page insert which includes contributions from, among others, Peyton Manning, Dwyane Wade, Tom Glavine, and Danica Patrick. In a question-and-answer format, they discuss the lessons they learned from youth sports and how they apply the lessons today. There is also a physician-penned section about illegal performance-enhancing drug use in sports. Murphy and his wife, Nancy, have 8 children: sons Chad, Travis, Shawn, Tyson, Taylor, Jake, and McKay and daughter Madison. 1 2 3 4 5 6 7 "Dale Murphy Statistics and History". Baseball-Reference.com. Retrieved 2015-06-25. ↑ Archived October 21, 2007, at the Wayback Machine. ↑ "Murphy's Law Is Nice Guys Finish First". CNN. July 4, 1983. Retrieved April 30, 2010. 1 2 Miller, Stuart (January 3, 2010). "Twice an M.V.P., but Never a Shoo-In". The New York Times. ↑ "Making the Hall call is never easy (cont.)". CNN. January 5, 2010. 1 2 Archived July 3, 2010, at the Wayback Machine. 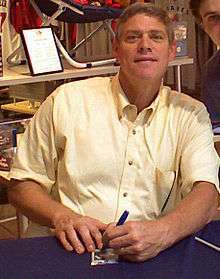 1 2 "Why Dale Murphy is still waiting – SweetSpot – ESPN". Espn.go.com. 2009-12-03. Retrieved 2015-06-25. ↑ Archived July 3, 2010, at the Wayback Machine. ↑ "Columns". CBSSports.com. Retrieved 2015-06-25. ↑ "2013 Hall of Fame Voting". Baseball-Reference.com. Retrieved 2015-06-25. ↑ O'Keefe, John (October 18, 1999). "Dale Murphy, Braves Double MVP". Sports Illustrated. Retrieved 2011-07-07. ↑ "Injecting Ethics Into America's Future". iWontCheat.com. Retrieved 2015-06-25. ↑ "Former MVP Takes a Stand Against Cheating". The New York Times. Retrieved 2015-06-25. ↑ "South | FOX Sports". Foxsportssouth.com. Retrieved 2015-06-25. ↑ Kruth, Cash. "Torre finalizes USA's World Baseball Classic staff | MLB.com". Mlb.mlb.com. Retrieved 2015-06-25. ↑ Murphy, Dale. "Dale Murphy Biography". Dalemurphy.com. Retrieved 2015-06-25.